We are very excited to offer our 2-day Statewide TxP2P Parent Conference! Our conference helps Texas parents learn how to deal with the unique issues and challenges they face on a daily basis in caring for their children. The two-day conference offers 50-60 different sessions within several tracks, each covering a different topic. The tracks include the following: advocacy (general and legislative), parenting and sibling issues (and a Sibshop), special education law (basic to advanced), medical issues (including Medical Home and Medicaid Waiver Programs), behavior, mental health, parent leadership, resources and services, self-advocacy, transition issues for youth and young adults with disabilities, and creating a good life for people with disabilities. Through seminars and face-to-face networking, parents, self-advocates, family members, caregivers and professionals learn from each other as they continue their unique journeys caring for a child with a disability or a special health care need. TxP2P’s goal is for everyone to leave the conference with renewed energy and passion along with tools and information they need to make positive changes for children with disabilities in Texas. Our speakers are the foundation of our conference - without our speakers, both parents and professionals, donating their time and travel expenses, our conference would not happen. If you have any questions about being a speaker or would like to get on the list for a current or future Speaker Request for Proposals, please send an email to speaker@txp2p.org. Sponsors partner with TxP2P in order to improve our conference programming and outreach so that more parents will receive the knowledge and assistance they need to effectively advocate on behalf of their children. Earn recognition for your organization and help Texas families at the same time. Sponsorships are available at a variety of levels and each comes with recognition options. Learn more about conference Sponsors. 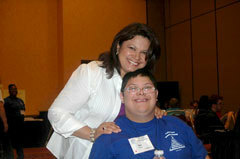 TxP2P anticipates that more than 550 parents and professionals will attend the conference each year. The conference facility offers an enhanced space that will be set up for two full days adjacent to all of the sessions. A conference promotion and door prize drawing will further encourage traffic. For more information, email exhibitor@txp2p.org. Call for Exhibitors: Exhibitor space is full.